Group work is a collective journey. How long will it take, and what will be the shape of the path? Consider what happens before, and after. Structure agendas in light of anticipated stages, choosing activities that align with each phase. Complete the arc to arrive at your desired destination. how much time does it take for the purpose of a convening to be fulfilled, and how is that time structured? What happens in between opening and closing? 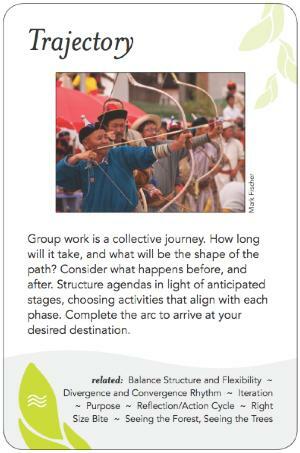 archteypal journey, what is the group equivalent of the hero's journey? This pattern is about the longer timeframe (which includes multiple gatherings, etc.) It is about tracking development over the course of multiple events, and also over the lifecycle of a single longer or multi-site event. Projects, programs, initiatives all have multiple time horizons. Each will have activities that are done by one or more group and others that are done by individuals. It is important that any facilitated event be appreciated and managed in the context of the larger project or set of activities of which the event is a part. This larger project or set of activities may have the same or a greater Purpose than that of the event. In addition, a single long or multi-site event may also require coordination of its constitituent sessions to ensure they are effectively contributing to the event's Purpose and Intention. The development of this pattern language itself required multiple events, each with a specific Purpose and Intention, plus much individual activity in between events. A Core Group was established to coordinate all these activities to ensure they collectively achieved the projects overarching Purpose. some book on instructional design . . .
"This event started long before it began and will continue long after it ends." -- from a 2008 Art of Hosting session.